I'm going to get straight to the point with this one - Brennen's spine has a pretty significant curve. 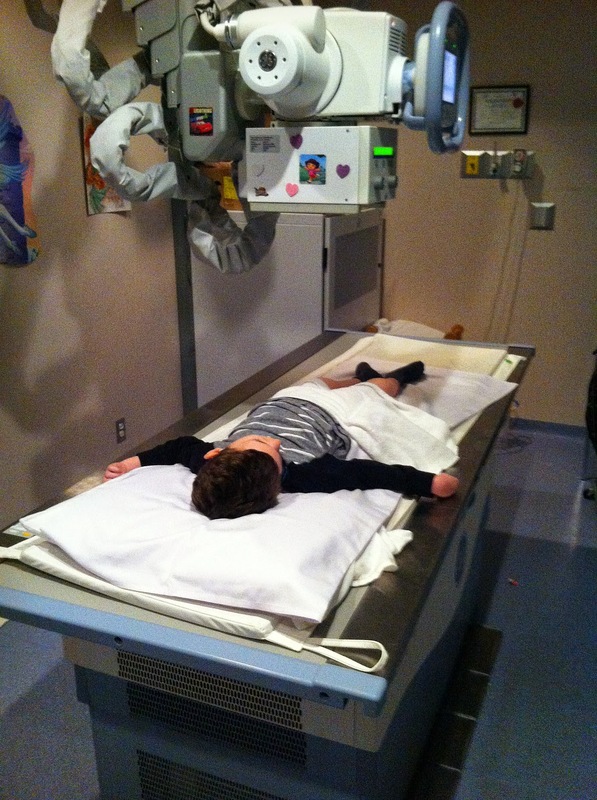 We have been keeping a close eye on it, with x-rays every 6 months and regular check-ups with an orthopedic surgeon. A few months ago we had a foam insert made for his wheelchair. 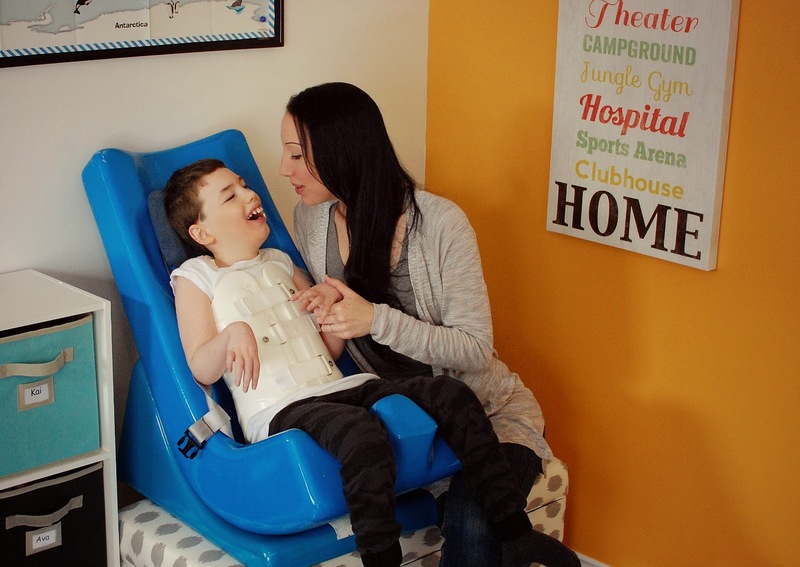 It was molded to his back to keep him upright while seated, and he is quite comfortable now in his chair. The issue is when he is out of his wheelchair, he tends to lean to one side, and this is not helping things. The curve in his back is becoming more pronounced. His right shoulder is lower than the left, and it is starting to affect his hip - the same hip he had surgery on a couple of years ago. After our last set of x-rays, we were referred to another orthopedic surgeon who specializes in spinal curvature. Brennen has neuromuscular scoliosis. "Neuromuscular scoliosis occurs in individuals of any age and secondary to another diagnosis such as Cerebral Palsy (CP) where significant weakness or conversely significant high tone or spasticity is present. In either case, this muscular imbalance & lack of trunk stability, over time, causes curvature of the spine." It was determined that Brennen is not yet a candidate for surgery. 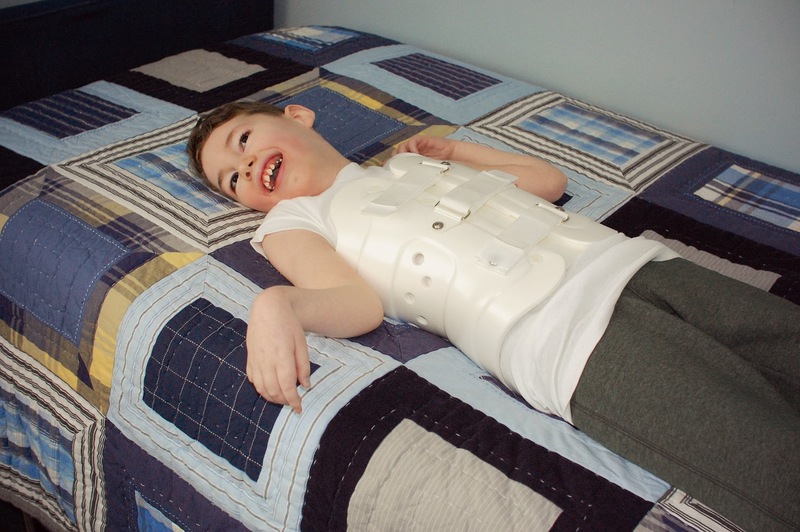 The curve in his spine can be straightened with support, and so we have decided to try a brace, or soft body jacket, to help prevent the curve from worsening. 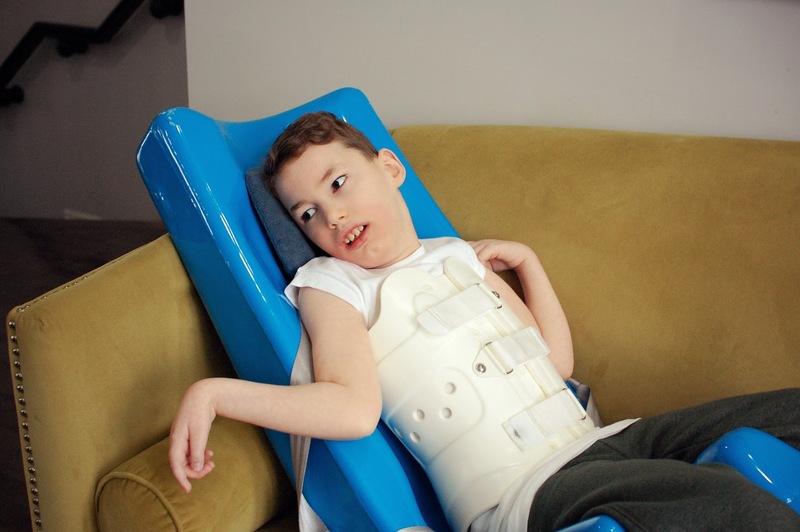 Brennen now has a custom TLSO Brace (Thoraco-Lumbo-Sacral-Orthosis), that he will wear only at home and only as often as he can tolerate it. He surprisingly doesn't mind the brace at all, and actually enjoys sitting up nice and tall with it! My hope was to avoid surgery, but I'm not sure we are going to do that. We may just be putting if off for another few years. On our last visit with the orthopedic surgeon, we discussed a little bit of what was involved with spinal fusion surgery. He asked if I wanted to see on an x-ray what the surgery looked like, and I guess by the various shades of white I turned, it was decided that I'm probably not ready for that just yet. I know that a couple of years ago I would have had a much harder time with this brace. It looks so institutional, so restrictive and confining. I remember when Brennen got his first pair of AFOs (Ankle/Foot Orthosis), when he was just two years old. I was saddened by the fact that he needed them. That he needed aids to keep his feet at the proper angle. It was just one more 'medical' thing added on to him - like the medication, and the glasses, and the neck brace, and the wheelchair and the standing frame. There was always something being added. We now know lots of little ones who wear AFOs, but I have never seen a body brace like this one. I asked the orthotist who was doing Brennen's fitting if they did many of these. He said, "Yeah, we do them for car accidents." Yeesh. So, anyway, I'm ok with the brace. It's just one more thing. One more thing to add to my STRESS list (Stuff To Remember Every Single Second). It is a constant and ever-growing list, but if I deal with one thing at a time, one step at a time, one day at a time, I can manage it. Brennen has been doing surprisingly well these past few months, but I cannot deny the true and very real pain of knowing that my child has to experience a life that has so many struggles. The journey we are on is a unique one, and I have come to terms with the fact that there will always be challenges and road blocks along the way. In the meantime, I will invest all of my time and love and energy into my son and supporting every single one of his complex needs.